I was an addict. I thought I could not change. I thought my thoughts were real. Today I read blogs and hear stories. I ponder addiction. Was I an addict? Cigarettes. Drugs. Alcohol. I felt stuck. That was my story. As a recovered addict I want to share a secret. That was A story. It was not real. 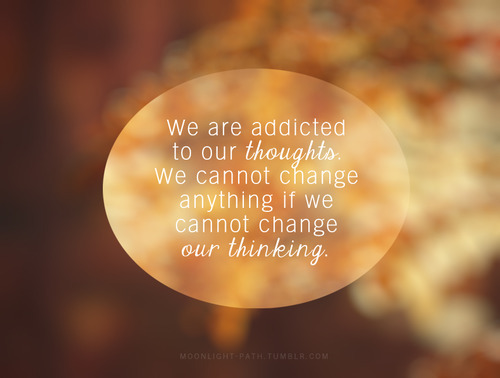 Addiction is as real as our thoughts. It is absolutely 100% no question an inside job. The idea an addict is "trying to quit" is a lie. I remember what "trying" felt like. It felt like whining. A big fat whining lie. Do I sound harsh? There are philosophical theories that say WE like our problems. Addicts like their problem. Addicts are recklessly playful while others suffer. They pretend. AND a real addict also knows the truth. Deep down. This is what I know. Recovery is easy. Pretending is crazy. When I chose to change. What happened? My thoughts changed. My heart changed. Those who loved me could see. Could feel. They knew. I wanted to change therefore I changed. My thoughts. My story. So I am curious. What do you think is the addict's secret?